Welcome back to the Small 12 Days of Christmas, 2010 edition: our annual recording of Christmas events in the Small World. This is where I share with you our traditions, annoy the rest of my dear family with my camera, and try to remember to maintain a sense of humor about cramming in All. The. Joy. This year, we had a houseful of company the weekend we would normally have gone to get our tree. We had a great time celebrating L.'s baptism and chasing around the house with cousins, but missed choosing a tree and visiting the farm animals at our usual nursery. J. was scheduled to be out of town most of the following week, so we decided we needed to head out on a Monday evening to get our tree home and in its stand. 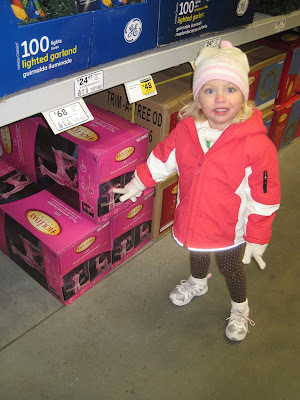 It was far too cold and dark to be tramping around anywhere festive, so it was off to Lowe's instead. It felt a little to me like the very special Christmas episode of Family Ties where Alex ends up buying gifts of cough syrup at the 7-11. But it's really all about the togetherness, right? sleeping right through the whole event. 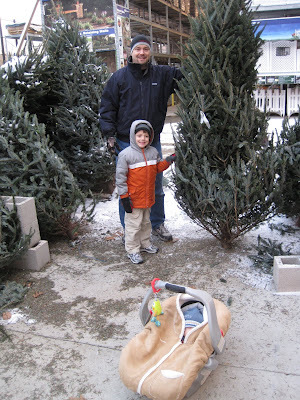 than the ten minutes total we spent purchasing our tree this year. You can't tell it from this photo, but our tree is absolutely the homeliest piece of evergreen we've ever brought into our home. Skinny, with weird gaps and branches that bend down and resist ornaments, and some weird sticky out portions up at the top. At this point, we still thought it would unfreeze and its branches would unfurl in a beautiful fashion. Oh well. And we're out of there! 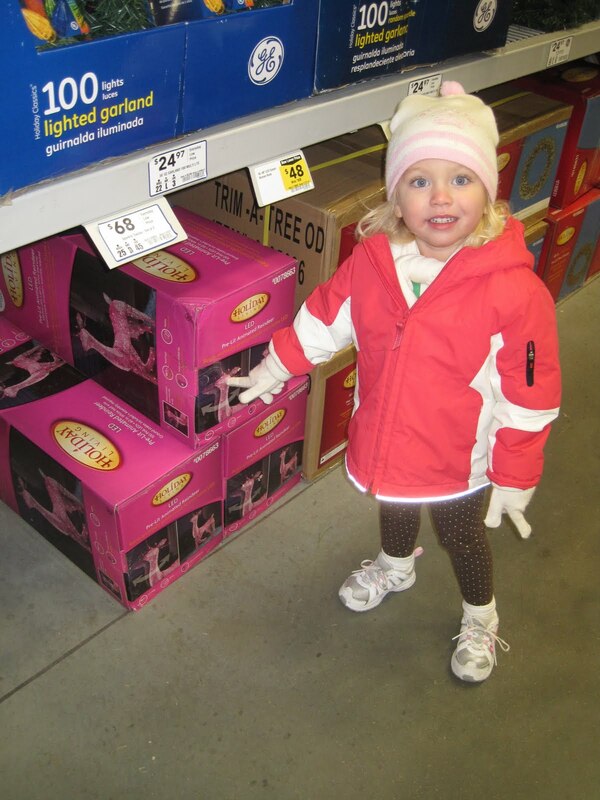 N., warming up inside the store, finds the bright spot of the whole venture: a pink lighted deer! Not pictured: J's facial expressions on the drive home, convinced we were going to be leaving our tree by the side of the road when it rolled right off his roof rack. Seems frozen fingers are not quite that proficient at tying knots. The tree made it home, though. And tomorrow, I'll tell you all about decorating it! But did you get the pink reindeer? Yep, right there with you on the tree. Although we got our at Home Depot instead of Lowe's. A pink deer? Seriously? Oh my.